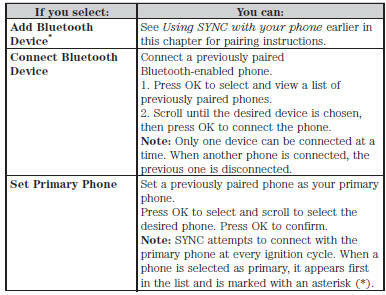 SYNC can support downloading up to approximately 1000 entries per Bluetooth-enabled cellular phone. Make sure the vehicle ignition and radio are turned on and the transmission is in position P.
To scroll through the menus, press the up and down arrows on your audio system. Wirelessly pairing your phone with SYNC allows you to make and receive hands-free calls. 1. Press the phone button; when the display indicates no phone is paired, press OK.
2. When Find SYNC appears in the display, press OK.
3. Put your phone into Bluetooth discovery mode. See your phone’s user guide if necessary. 4. When prompted on your phone’s display, enter the six-digit PIN provided by SYNC in the radio display. 5. The display indicates when the pairing is successful. 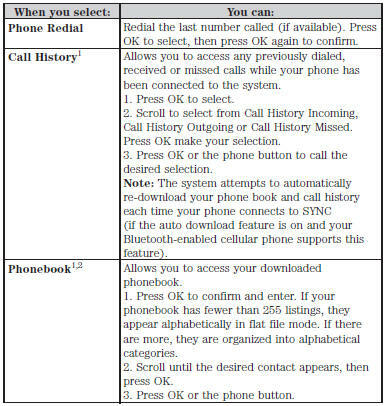 Depending on your phone’s capability and your market, the system may prompt you with questions such as setting the current phone as the primary phone (the phone SYNC automatically tries to connect with first upon vehicle start-up), downloading your phone book, etc. Note: To scroll through the menus, press the up and down arrows on your audio system. Note: Make sure the vehicle ignition and radio are turned on and that the transmission is in position P.
1. Press the phone button and scroll until System Settings is selected. 2. 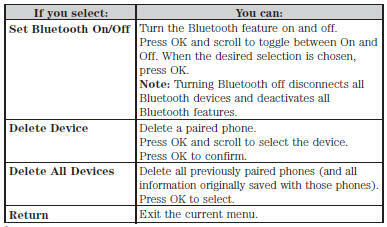 Press OK and scroll until Bluetooth Devices is selected and press OK.
3. Scroll until Add Bluetooth Device is selected and press OK.
4. When Find SYNC appears in the display, press OK.
5. Put your phone into Bluetooth discovery mode. See your phone’s user guide if necessary. 6. When prompted on your phone’s display, enter the six-digit PIN provided by SYNC in the radio display. The display indicates when the pairing is successful. 7. 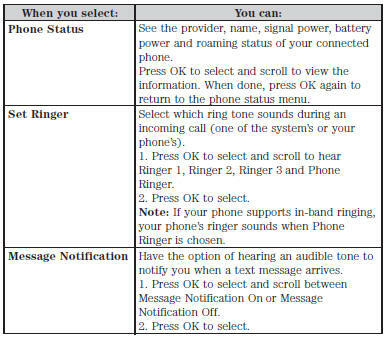 The system then prompts with questions such as if you would like to set the current phone as the primary phone (the phone SYNC automatically tries to connect with first upon vehicle start-up), download your phone book, etc. 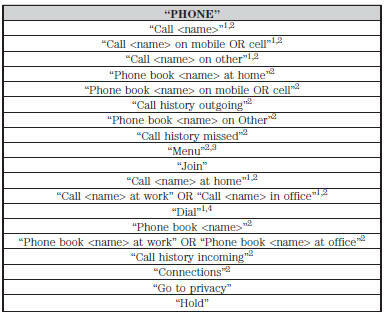 1.These commands do not require you to say “Phone” first. 2.These commands are not available until phone information is completely downloaded using Bluetooth. *Words in ( ) are optional and do not have to be spoken for the system to understand the command. 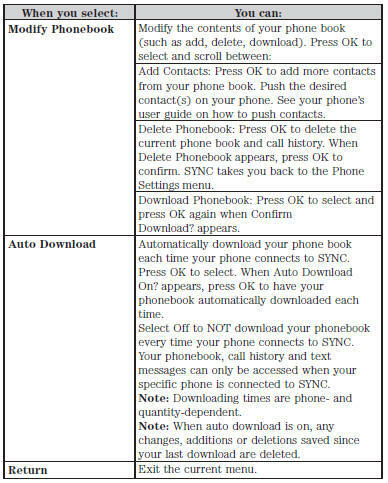 Phone book commands: When you ask SYNC® to access a phone book name, number, etc., the requested information appears in the display to view. Press the phone button and say “Call” to call the contact. Note: To exit dial mode, press and hold the phone button or press MENU to go to the PHONE menu. Press the voice icon and when prompted say: 1. Say “Call <name>” or “Dial”, then the desired number. 2. When the system confirms the number, say “Dial” again to initiate the call. To erase the last spoken digit, say “Delete” or press the left arrow button. To erase all spoken digits, say “Clear” or press and hold the left arrow button. To end the call, press and hold the phone button. When receiving a call, you can: • Answer the call by pressing the phone button. 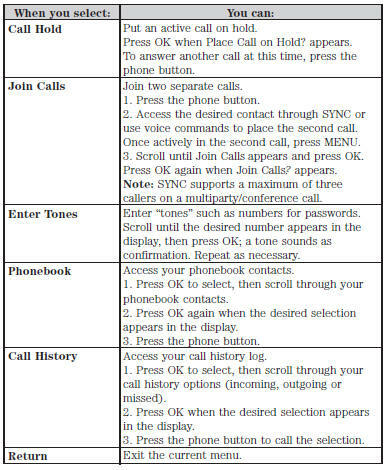 • Reject the call by pressing and holding the phone button. • Ignore the call by doing nothing. During an active call, you have additional menu features which become available such as putting a call on hold, joining calls, etc. Use the arrow buttons to scroll through the menu options. To access: 1. Press MENU during an active call. 2. 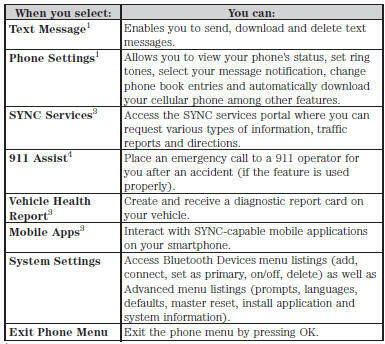 When Active Call Menu is selected, press OK.
SYNC’s phone menu allows you to redial a number, access your call history and phone book and send text messages as well as access phone and system settings. You can also access advanced features, such as 911 Assist, Vehicle Health Report and SYNC Services. 1. Press the phone button to enter the Phone Menu. 1This is a phone-dependent feature. 2This is a phone-dependent and speed-dependent feature. 3If equipped, United States only. 4If equipped, United States and Canada only. Note: This is a phone-dependent feature. SYNC allows you to receive, send, download and delete text messages. The system can also read incoming text messages to you so that you do not have to take your eyes off the road. Note: This is a phone-dependent feature. Your phone must support downloading text messages using Bluetooth to receive incoming text messages. Note: Forwarding a text message is a speed-dependent feature and can only be done when the vehicle is traveling at 3 mph (5 km/h) or less. Note: Only one recipient is allowed per text message. When a new message arrives, an audible tone sounds and the display indicates you have a new message. You have these options: 1. Press the voice button, wait for the prompt and say “Read Message” to have SYNC read the message to you. 2. Press OK to receive and open the text message or do nothing and the message goes into your text message inbox. Press OK again and SYNC reads your message aloud as you are not able to view the message. You can then also choose whether you’d like to reply or forward the message. 3. Press OK and scroll to choose between: • Reply to Text Message: Press OK to access and then scroll through the list of pre-defined messages to send. • Forward Text Message: Press OK to forward the message to anyone in your Phonebook or Call History. You can also choose Enter Number. Text messaging is a phone-dependent feature. If your phone is compatible, SYNC allows you to receive, send, download and delete text messages. 2. Scroll until Text Message appears and press OK.
3. Scroll to select from the following options: Send Text Message? enables you to send a new text message based on a pre-defined set of 15 messages. Download Unread Msgs allows you to download your unread messages (only) to SYNC. To download the messages, press OK to select. The display indicates your messages are being downloaded. When complete, SYNC takes you to your inbox. Delete All Messages? allows you to delete current text messages from SYNC (not your phone). To delete the messages, press OK to select. The display indicates when all your text messages have been deleted and SYNC returns you to the text message menu. Note: SYNC does not automatically download all of your unread text messages at every ignition cycle (as it does with call history and phonebook if automatic download is set to on). Return exits the current menu when you press OK. If you select Send Text Message? : 1. Press OK to select. If the system detects your phone does not support this feature, Unsupported appears in the display and SYNC returns to the main menu. 2. Scroll to cycle through the message options in the following chart. 3. Press OK when the desired selection is in the display. The system now needs to know who to send the message to. 4. Scroll to cycle through Phonebook or Call History entries. You can also select Enter Number to audibly enter a desired number. 5. Press OK to enter the desired menu and scroll to select the specific contact. 6. Press OK when the contact appears and press OK again to confirm when the system asks if you would like to send the message. Each text message is sent with the following signature: “This message was sent from my <Ford or Lincoln>”. 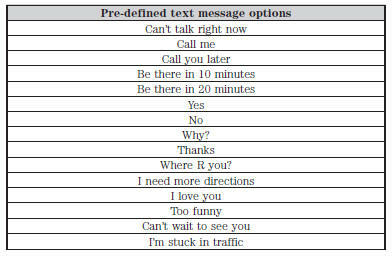 These are phone-dependent features. Your phone settings allow you to access and adjust features such as your ring tone, text message notification, modify your phone book and also set up automatic download. 2. Scroll until Phone Settings appears, then press OK.
System Settings provide access to your Bluetooth Devices and Advanced menu features. Use the arrow buttons to scroll through the menu options. The Bluetooth Devices menu allows you to add, connect, delete and set a phone as primary as well as turn your Bluetooth feature on and off. The Advanced menu allows you to access and set prompts, languages, defaults, perform a master reset, install an application and view system information. This menu allows you to add, connect, delete, set a phone as primary, and turn Bluetooth on or off. 2. Scroll until System Settings appears and press OK.
3. Scroll until Bluetooth Devices appears and select OK.
*This is a speed-dependent feature. 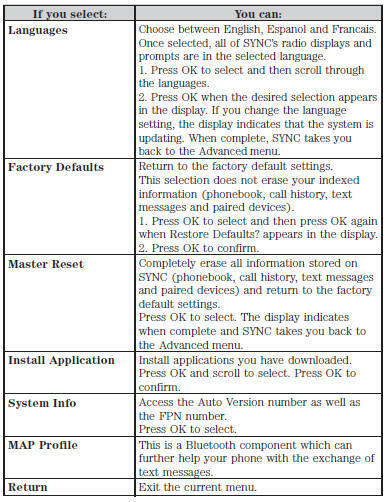 This menu allows you to access settings such as prompts, languages, defaults, perform a master reset, install an application and view system information. 3. Scroll until Advanced appears and select OK.